I have ended up with extra copies of a few movies and TV series that we greatly enjoy here as a family. I have three BBC America Titles, Hamlet, Merlin, and 30th Anniversary Spot. I also have two children’s DVD’s Care Bears in Share-a-Lot in Care-a-Lot from Lionsgate, and NoonBory & the Super7 from NCircle. Enjoy the greatest performance of Hamlet. With David Tennant playing Hamlet and Patrick Stewart as The King and Claudius, what isn’t there to love. When I found out they were having this play in London, I wanted to grab the next flight to see it performed live. I can’t tell you how happy I was to see it be transformed into DVD for all to see. Watching this version made me understand things that I have never been able to understand before. Even my husband felt that the pentameter was perfect for dialogue. We’ve watched it twice together. David Tennant and Patrick Stewart star in this critically acclaimed production of Shakespeare’s masterpiece from Britain’s renowned Royal Shakespeare Company. No recent stage production in Britain has attracted the excitement and nearly unanimous critical praise as this Hamlet. Tennant’s interpretation was recognized as defining the role for a generation, and Stewart’s complex Claudius won the Olivier award, Britain’s highest stage honor. In this specially-shot screen version, filmed on location rather than in the theater, Tennant and Stewart reprise their roles. Dynamic, exciting and contemporary, it breathes new life into Shakespeare’s greatest play. Another BBC America great TV series for those that love magic and mayhem because Arthur and Merlin are always in it. I’m really not sure how Merlin is going to keep his secret safe for any longer. He’s always using magic to save the day. As what Smallville did for Superman, Merlin is a new drama series that updates the story of the infamous sorcerer of Arthurian legend for a new audience. In a time before history began, the mythical city of Camelot was a fantastical realm and a dangerous world in which magic has been banned by the ruthless tyrant Uther Pendragon. When Merlin, a young man gifted with extraordinary magical powers, arrives in the kingdom, he discovers his destiny and that of the kingdom’s young leader in waiting, Arthur, are inextricably linked. My children love Spot and what he’s getting into. In fact, when we went to the library we had to check out some Where’s Spot library books. I love that Where’s Spot was on Playhouse Disney, more people have a subscription to Disney than BBC America, we don’t have either right now so when Warner Brothers sent us a copy to review we were all quite ecstatic. The 30th anniversary DVD of Where’s Spot has six episodes and what Miles loves is that every episode has a special song. My son loves to sing and when he gets a song in his head it’s a beautiful thing. This April, the BBC celebrates the 30th anniversary of the ever-curious and always adorable puppy, Spot, with the DVD release – Where’s Spot? 30th Anniversary Edition. Based on the signature lift-the-flap children’s books by Eric Hill, the classic TV show – which aired on The Disney Channel’s Playhouse Disney preschool block – follows the adorable children’s icon on everyday adventures as Spot and his friends play at the park, take their first nature walk and splash around in a rain puddle. Where’s Spot? 30th Anniversary Edition boasts six endearing episodes with Spot voiced by Jonathan Taylor Thomas (The Lion King, Home Improvement), and each episode is accompanied by its own special song. Additionally, the DVD contains three bonus episodes in which the beloved puppy voiced by actor Hayley Joel Osment (The Sixth Sense, Pay it Forward), along with a reading of Where’s Spot by author Eric Hill and two interactive games. 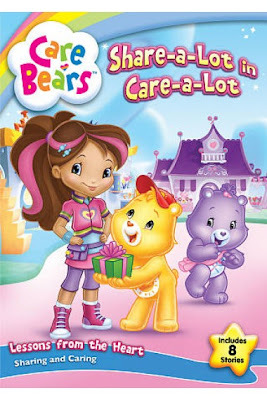 Learn some great lessons for children watching Care Bears: Share-a-lot in Care-a-lot from Lionsgate. See your favorite good guys like Share Bear, Grumpy Bear, and a not so nice friend Grizzle. Join the Care Bears for eight wonderful tales filled with sharing and caring delight! Whenever it’s the Care Bears welcoming Grizzle, Share Bear helping Harmony overcome her fears on Surprise Day, or McKenna learning the joys of giving at a Giving Party, the Care Bears discover that warmth and kindness bring friendship and fun! Get ready to journey into Care-a-lot for more charming Care Bears adventures! Watching Noonbory & The Super7 with my kids was at first very confusing, then I realized, I was just asleep. It’s not boring to the kids, they love it. So when I woke up I found that it’s teaching the kids about their senses. Touch, Smell, Taste, Sight and Hearing, each represent a different character and then you have Noonbory who seems to be their leader. Kids loved it. When trouble is brewing or super silly villainy is taking place in the whimsical world of Tobalooba, it’s up to Noonbory and his sensational team of super-sensing problem solvers to save the day! Each of our superhero borys has a super sense, including sight, sound taste, touch, smell and of course, a little common sense and nonsense never hurts. Tell me what your favorite family movie is. I received these titles for my time in this post. All opinions expressed are my own. My favorite family movie is Home Alone. our favorite family movie is bambi. Oooohhh! I want that Hamlet!!! I would LOVE to see David Tennat in the role, and compare to Branagh. I’m drooling over here! My favorite family movie is Cinderella (the Disney one, of course). One of my favorite family movies is this mini series we watched called the 10th Kingdom. It was all about fairytales and the different characters from Cinderella and snow white. It had a lot of good actors in it. It is a wonderful movie to get lost in. My favorite family movie is Disney’s UP. I love the Anne of Green Gables series. Our favorite movie is The Princess Bride with Cary Elwes. That is sooooo funny!!! My favorite family show is Anne of Green Gables. We love the movie The Never Ending Story. Our favorite Family Movie right now is Pixar’s Cars. Love them! We love willy wonka and the chocolate factory! I subscribe to mom start via e-mai! My fave is Sleepless in Seattle! Our favorite family movie is Facing the Giants….LOVE that movie!! We like finding nemo and big. We all love Swiis Family Robinson. Hmmm family movie there’s so many but a really fun one for all ages is Milo and Otis. You won the Movie Night Giveaway. Woo Hoo! Please send me your full name and address and phone number just in case. Then I can send your information to the sponsors. family movie I love is Aladdin!! My favorite family movie is Chitty Chitty Bang bang. I’ve watched it so many times I can sing along. we like the Harry Potter movies in our house! A favorite for us is The Sandlot. Our family will sit still to watch the whole movie! My favorite family movie is Flight of the Navigator, yes it is an older movie (80’s) but we love it! One of our favorites is Willy Wonka and the chocolate factory. Thanks for the chance. My all time favorite would be the parent trap with Brian Keith, it’s an old movie, but I enjoy every time it’s on tv, and I have the dvd, which all of us watch. Basically whatever my son wants to watch. Lately that’s either Princess & the Frog or IronMan. Go figure. We all like Aliens vs Monsters. I’d have to say Beauty and the Beast. My favorite family movie is “Big” with Tom Hanks. The family always gathers around the tv when it is on. Thanks for the review and giveaway! my favorite family movie is the first shrek, i love it! My favorite family movie would have to be the original Snow White. Although it wouldn’t be a family film, I sure would love to win Hamlet! Our favorite family movie is Shrek!! Star Wars: A New Hope. Definitely an all time favorite. As for Hamlet, I’m not sure if David Tennant will beat out Ken Branagh in my heart. I did love Ken’s Hamlet, but I’ve only seen his on film. I did get to see See David live and he was wonderful. I’m looking forward to reliving my experience through the DVD. I saw someone else say this , too, but I think ours is Star Wars: Episode 4. My favorite family movie is Charlie and the Chocolate Factory. Ours is Princess and the Frog. Our favorite family movie is The Little Mermaid! Our favorite family movie is Meet the Robinsons. Love the soundtrack, too!!! Our favorite family movie (ok well mine) is Finding Nemo. Ours is still The Wizard of Oz. Our favorite family movie is Harry Potter and the Chamber of Secrets. Mary Poppins because as the kids have informed me…….there aren’t any bad guys in it. Up to the highest height!!! Lord of the Rings Trilogy is the favorite. Only one? I am going with The Neverending Story (the original, not the dreadful sequels). Truly a timeless classic the whole family can enjoy. Thank you for the great give-away. We’re getting a lot of mileage from Wall-E.
Wall-E is my favorite family movie. We recently fell in love with Up! We loved How To Train A Dragon. Favorite family movie would have to be The Sound of Music. My favorite famiy movie is Toy Story. Can’t wait to see Toy Story 3 this Summer. We watch Ice Age a lot so that’s the main movie that’s coming to mind! We still like watching Beethoven! Thanks! i love the anne of avonlea series or the made for tv movie merlin. We have been watching Shrek regularly since it came out. I used to have to be Shrek and my granddaughter was Fiona (thank goodness we have gotten past that), now we enjoy the movie and have lots of laughs. Monster Inc. , Ice Age, and Mulan seem to make the rounds every few months, when they don’t it will be a sad day. My family loves The Neverending Story. They watch it over and over. My favorite family id Disney’s the little mermaid. My favorite family movie is Avatar. My favorite family movie is Swiss Family Robinson. We love the movie CARS. Our favorite family film would have to be either “Babe” or “The Sound of Music,” both of which we’ve watched a million times and never get tired of them. Thanks! Our favorite family movie is Cars. Meet Me in St. Louis is our favorite family film. My favorite family movie is The Sound Of Music. It’s a Wonderful Life is my fave. My favorite family movie is Shrek.